For the first year ever, higher ed institutions have reported that they're feeling the squeeze on bandwidth consumption from wearable devices. 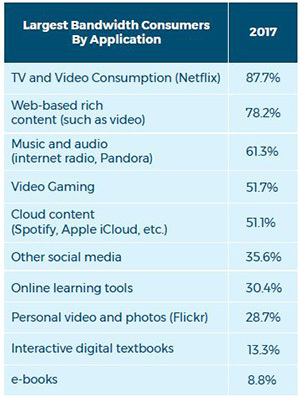 And colleges and universities have placed TV and video consumption — and specifically Netflix — at the top of the list as the application contributing most to the growth of bandwidth demand on campus. Purely academic applications — online learning tools and digital textbooks — hardly registered a blip. Those are a few of the new findings in this year's "State of ResNet" survey done by the Association for College and University Technology Advancement (ACUTA) and Association of College and University Housing Officers-International (ACUHO-I). The annual report analyzed responses from 450 surveys representing 320 schools across the country. 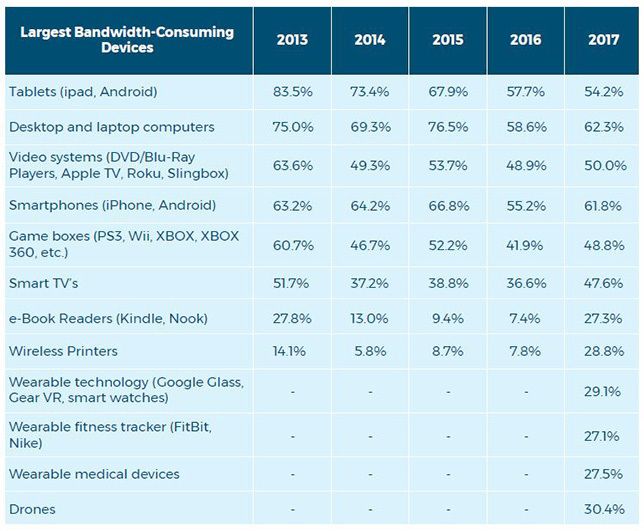 Respondents, representing IT, housing and business people on campus, were asked to rate a list of devices from 1 to 10 based on the impact each could have on bandwidth consumption for the residential network in coming years. A rating of 1 represented the smallest bandwidth consumer; 10 was the largest. The researchers then tabulated the "severity" percentages for each device by the respondents who gave ratings between 8 and 10 for each device. As was the case last year, computers — both desktops and laptops — appeared at the top of the list as having the most severe impact, cited by 62.3 percent of respondents, up from 58.6 percent in 2016's report. Smartphones, ranked third last year, came in second this year (61.8 percent) followed by tablets (54.2 percent). Wireless printers shot up from 7.8 percent of respondents expressing concern in 2016 to 28.8 percent saying the same in 2017. But that rating was about equal to several new categories this year: wearable technologies, wearable fitness trackers, wearable medical devices and drones, all of which hovered between 27 and 30 percent. In a follow-on question, participants were asked to rate various applications used by student housing residents that contribute to increases in bandwidth demand. Here, entertainment rules. TV and video consumption dominated the list, with almost 88 percent of respondents rating it as severe. More general "web-based rich content," such as video, came in second at 78 percent. Online learning tools were cited as influencing bandwidth demand increases by 30 percent of respondents, and interactive digital textbooks by a mere 13 percent. Keeping up with demand may not concern these institutions, because most practices related to constraining student access to bandwidth are down across the board. The practice of shaping and limiting bandwidth by protocol dropped from 46 percent of institutions in 2016 to 31 percent in 2017. Blocking peer-to-peer sharing and music downloads dropped from 40 percent to 34 percent over the same period. And capping network-wide throughput available to streaming video dropped from 20 percent to 11.5 percent. Also, the report noted, schools that outsource management of the ResNet and internet "are less likely to require bandwidth management practices." Along with that, outsourcing of ResNet services is on the rise except when it comes to running the help desk. The complete report, being formally released this week during the 2017 ACUTA Conference and Exhibition in Chicago, is available on the ACUTA website here.